Okay, for those who don't already know (which is not many), Thai House is a successful chain of restaurants in the GVRD. And I'm also sure you know that many people consider it the McDonald's of Thai food as well. Sure, the food is middle-of-the-road and safe for the general public, but really, that is the whole point. People forget that restaurants, much like other businesses, exist to make a profit. Hence, many restaurants appeal to the lowest common denominator. Since I've never blogged about the Thai House, I gathered up the family to go for their AYCE brunch at the Kits location. Despite not being cheap at $17.00 per person, the AYCE brunch is a good way to sample many different dishes at a fixed cost. We've done the AYCE in the past and it is generally a good idea to have a bigger party. However, that didn't prevent Viv and I from ordering far too much food. We started with the Tom Yum Goong soup which was surprisingly decent. 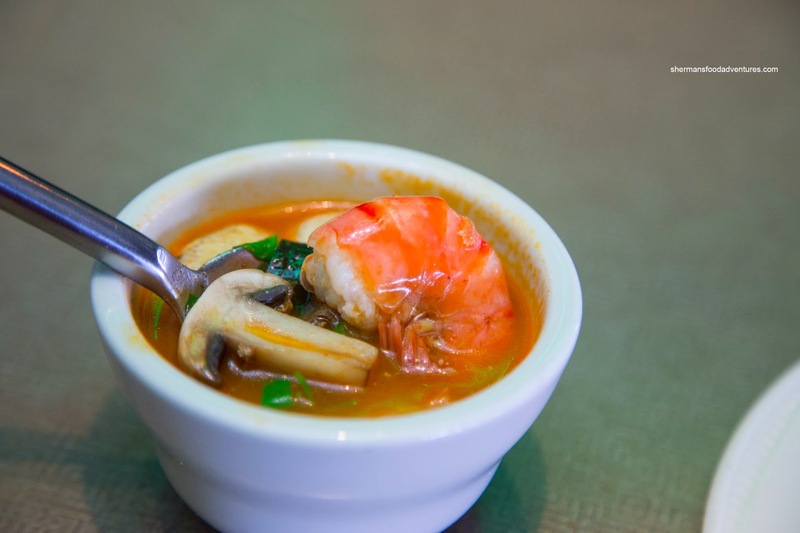 With large meaty shrimp and an array of flavours such as lemongrass, galangal and fish sauce, the soup had a mild spice. 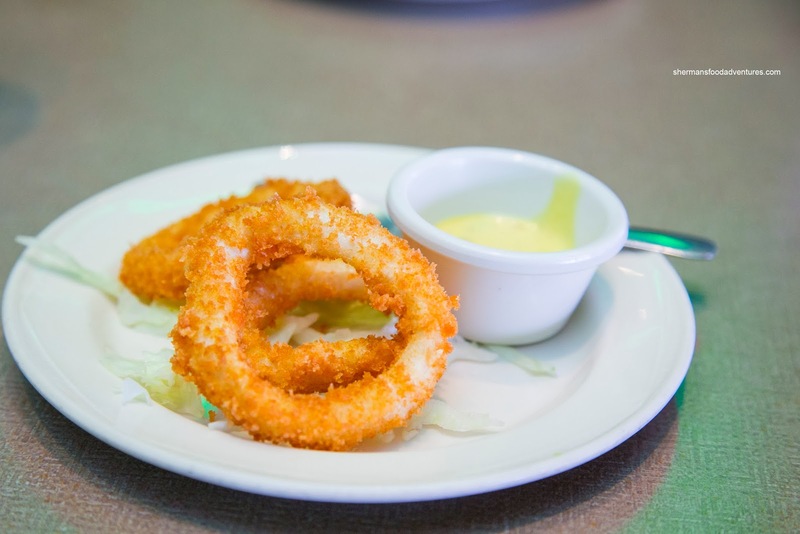 Next was the Fried Calamari which was pretty much more or less standard with a crunchy breading. The squid was sufficiently tender, but the dip was far too sweet. Onto something everyone liked, including the kiddies, was the Fried Chicken Wings. Consistent with many other Asian versions, these were big in size and super juicy. With a nice contrasting crunchy exterior, these were executed really well. The accompanying sauce was a good combination of tart, sweet and some spice. Another kiddie favourite was the Pad See-Iw (rice noodles with beef, egg and broccoli). Although the noodles were a touch soft, the dish wasn't bad. There was a good amount of tender beef and crisp veggies. With only a light kiss of soy, the noodles were mild tasting, which worked for the kiddies. 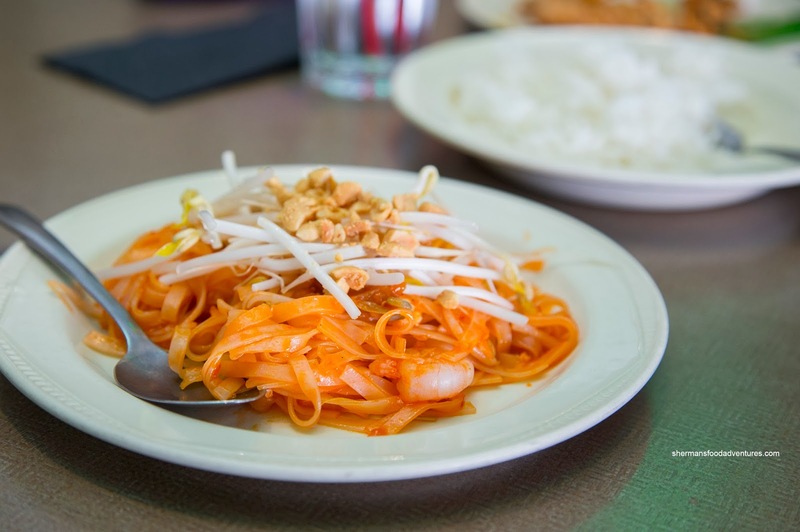 For the adults, we had the Pad Thai. It is no secret that tamarind is not used in their version of the dish, instead giving way to ketchup and sweet chili sauce. Now, that is a bone of contention for the authenticity police. For me, I understand the reason as not everyone likes tamarind (I have quite a few friends who don't). Personally, I prefer the tamarind (and spicier) version, but this one was alright for what it's worth. The noodles were still chewy while the usual ingredients such as pressed tofu, shrimp, pickled turnip, peanuts and bean sprouts were present. Onto the Chicken Lettuce Wrap, I found that there was caramelization due to the high wok heat, yet the flavours were muted in general. The veggies were still vibrant while the pieces of lettuce were trimmed neatly. 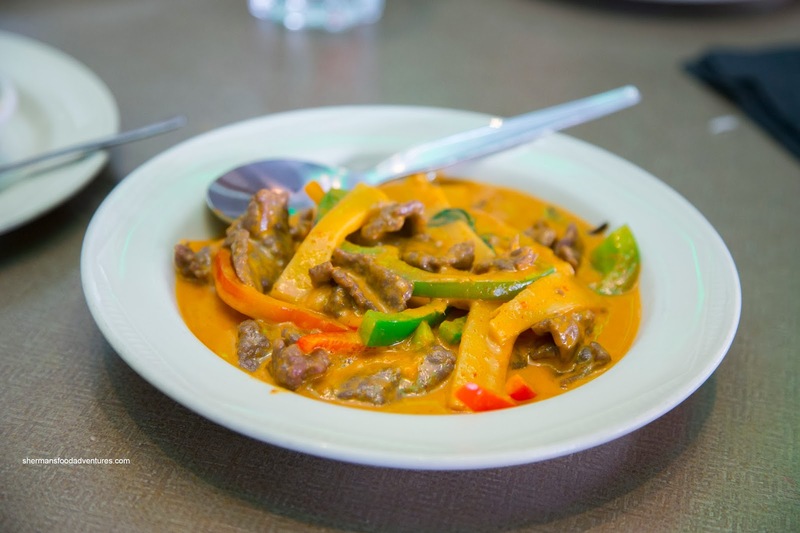 Moving onto some curries, we had the Chicken Green Curry and Beef Red Curry. 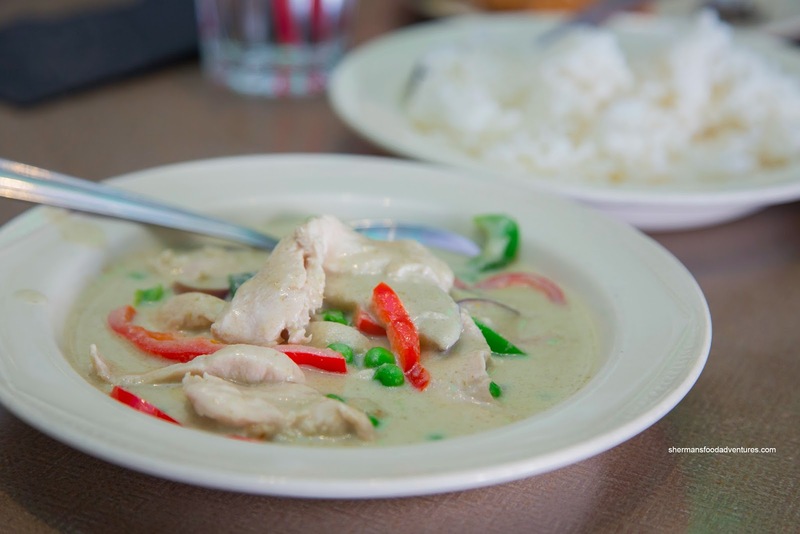 We found the green curry to taste remarkably like the Thai House packaged sauces. I guess this statement could be interpreted 2 ways. 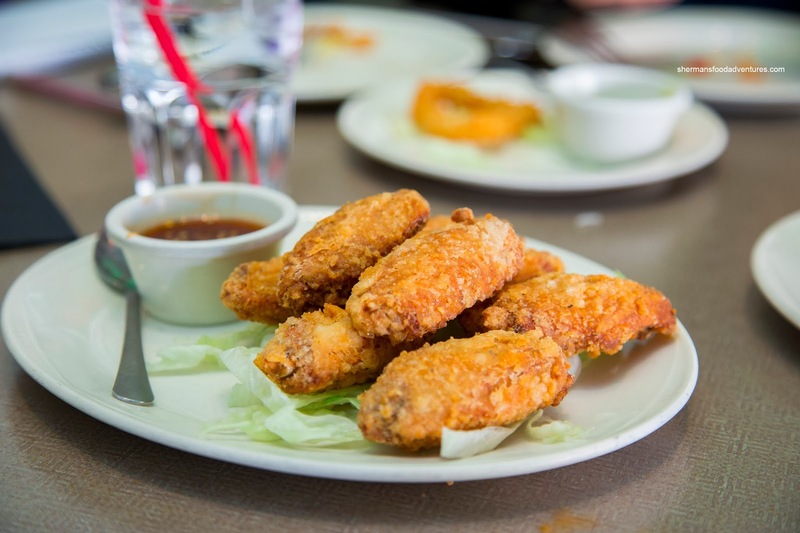 Either it can be considered as consistency across the board or formula chain restaurant food. Whatever the case, it was fine for what it was. It was on the creamier side with mild flavours and only a smidgen of heat. The same could be said about the red curry as well. Personally, I prefer my red curries to be less thick and creamy with much more spice. Yet then again, they are appealing to a wider audience. 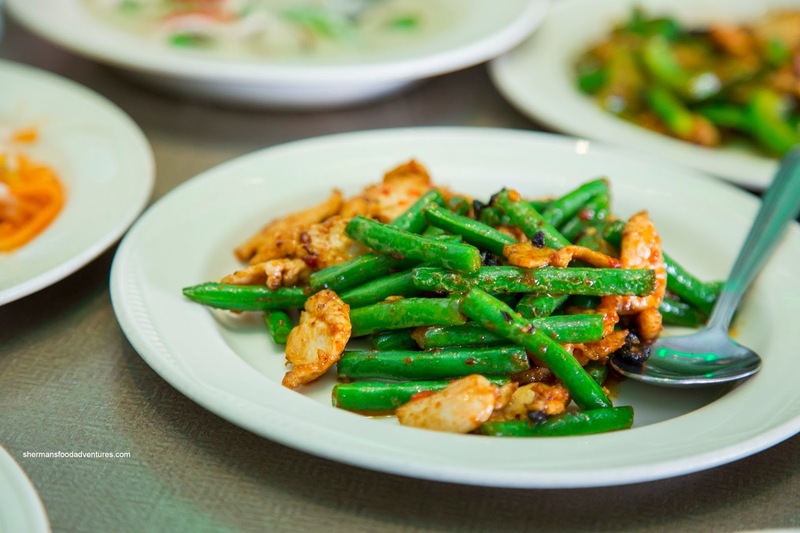 We liked the Green Beans with Chicken in Chiang Mai Sauce as there was a caramelization of flavours and a nice dryness to the dish. Hence, the beans were vibrant and crunchy while the chicken was flavourful. On a side note, I've only seen this version of green beans served at the Thai House, so I'm not even sure what "Chiang Mai Sauce" truly represents. Whatever the case, it had a good combination of spice, salt and palm sugar. 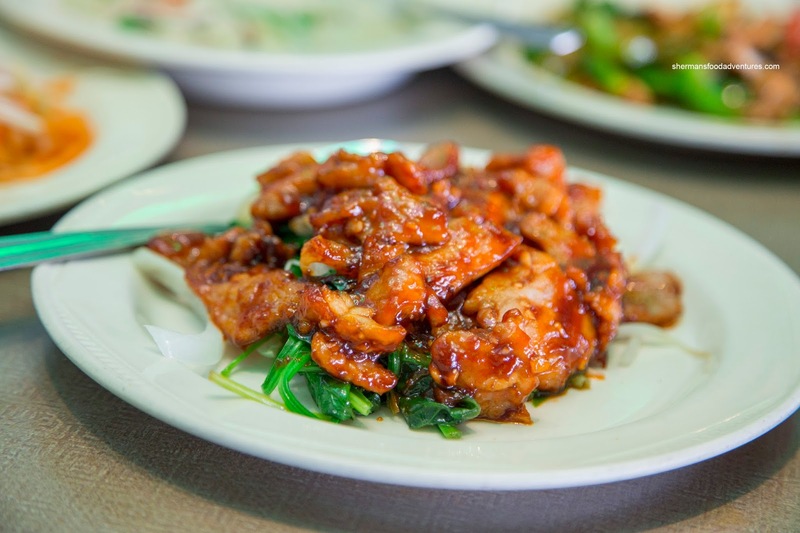 Lastly, we had the Thai Garlic Pork that was more sweet and salty rather than garlicky. The pork was moist and soaked with flavour, but in the end, it was just too sweet. 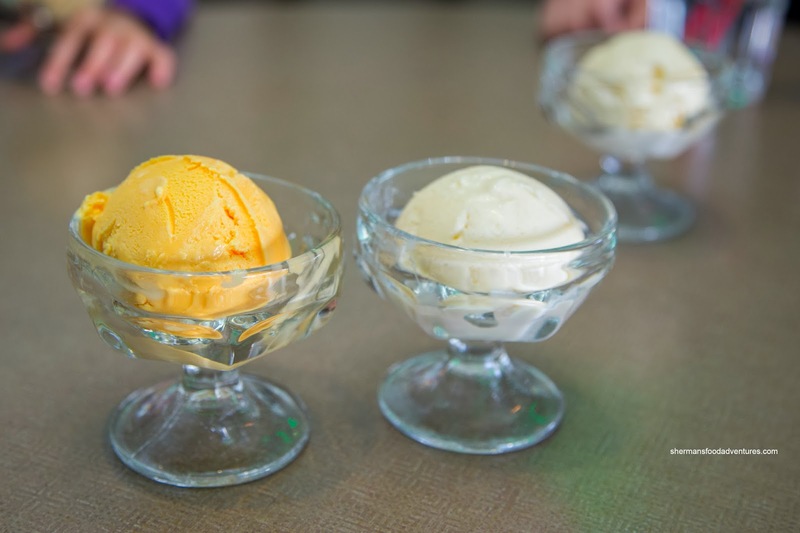 To end off the meal, we got a few scoops of Mango and Coconut Ice Cream. For an AYCE, the inclusion of ice cream was a definite treat. Now if we look at the price, $17.95 is pretty steep for lunch, no matter how much you eat. 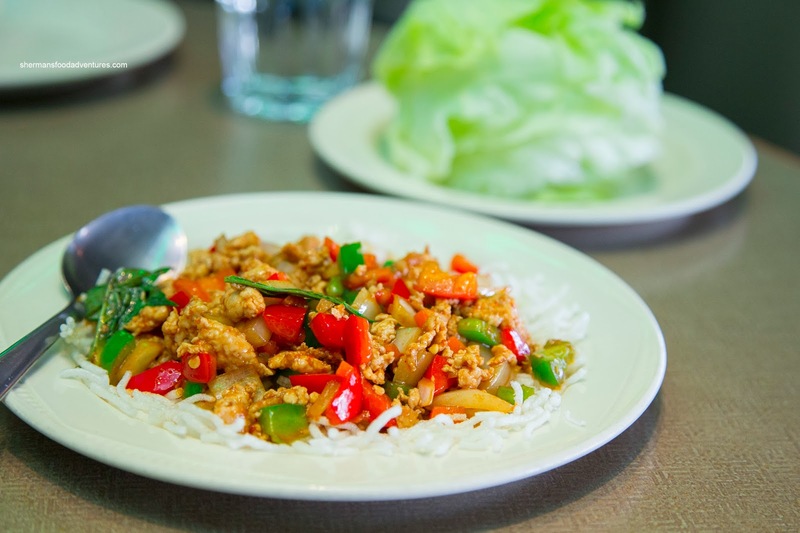 Yet, Thai food in general has never been necessarily that inexpensive either. For what Thai House is about, the food was fine. Was it super-authentic Thai? Well no, but their target market does not necessarily want tamarind nor mind-blowing spiciness. Rather, the food we ate was safe, accessible and generally pretty good (if you take everything into consideration). Sometimes, hating something due to the fear of others judging you is not a good enough reason. Thank you for doing this review Sherman. I've always found the Thai House to be pretty good in general. I can not tolerate really hot and spicy food so to me the Thai House is accessible and welcome. The food quality was quite good (ie the prawns in the Tom Yum Soup) and portion sizes are quite decent. We've always had good service as well. I think it's actually quite amazing to get such a good and consistent quality of meal for a buffet. 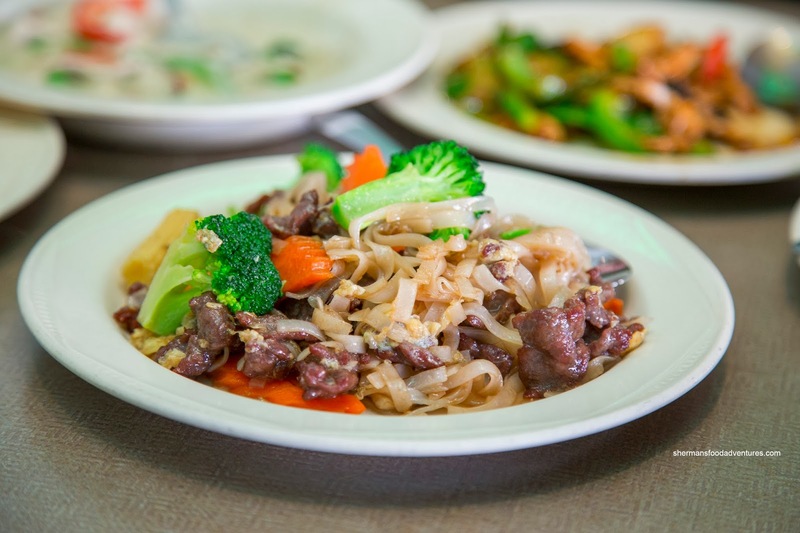 Thai House has been around for decades now. So FWIW they've been doing something right for their clientele. 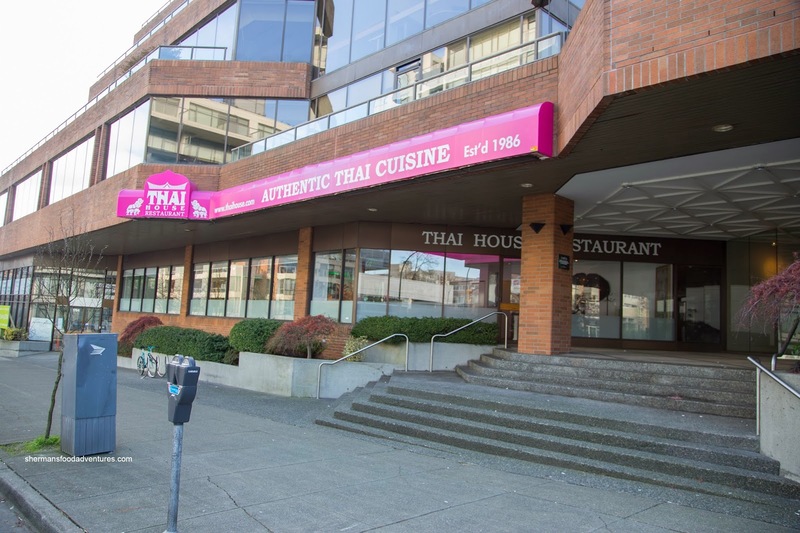 With 4 TH locations (5th one at Metrotown Station Square is now closed due to the Station Square construction), an Urban Thai, Pink Elephant and the Rio Brazilian Steakhouse in its empire, TH should stick around for many years to come.